For low noise, low impedance amplifier applications such as moving coil input stages for hi-fi pre-amplifiers, and professional microphone buffer stages, it is essential to minimise noise generated by resistive components within the input loop. This is sometimes effected by using a parallel arrangement of devices or using large power transistors, both methods being valid ways in which the effective base resistance (rbb) seen by the circuit can be reduced. However, superior and reproducible results can be realised by employing the Zetex range of medium power devices. This is due to the base resistance presented being much lower than with small signal devices. The absolute value of rbb is difficult to define as it is extremely bias dependent, but is typically a few ohms. 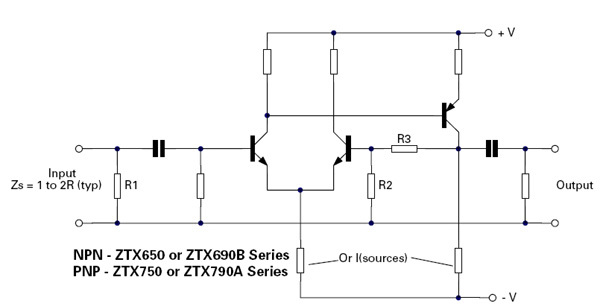 For comparative purposes, the noise factor produced by a ZTX650 transistor is 0.25dB compared with typically 2dB for a small signal type, at the industry standard test condition of 1 kHz, 5V, 200mA, and Rs = 2kO. In the example circuit given, which is essentially a discrete component realisation of an op-amp, R1 effectively sets the input impedance, (cartridge manufacturers provide optimum load resistance values), while R3/R2 set the gain. Some optimisation may be achieved, dependant on application, by operating the input pair at seemingly high currents, (typically 10-40mA), thereby reducing the effects of emitter resistance. Current sources for the differential pairs tail current and the PNPs collector current could be replaced with current sources, similarly active loads for the diff amp are also an option. Variations on the simple design shown are capable of yielding figures of better than -180dBv/Hz noise contribution per device.